With the Minimum Tax Credit, the Alternative Minimum Tax can result in future tax benefits in certain situations. 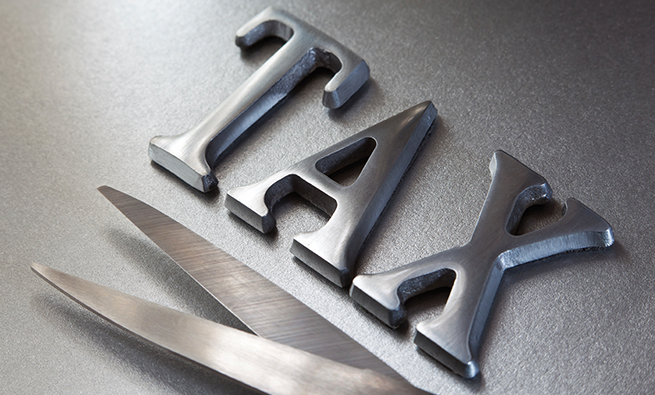 The Alternative Minimum Tax (AMT) is a parallel tax system with a long history. It began in the 1960s, when it was designed to catch high-earning taxpayers who didn’t pay their “fair share” in taxes. All taxpayers (individuals and entities) can be subject to this tax, but it only affects a taxpayer whose regular income tax liability is less than the Tentative Minimum Tax (TMT). For corporations, the TMT is calculated by multiplying the AMT base by 20%. For taxpayers with a tax base of $185,400 or less or for married taxpayers filing separately with a tax base of $92,700, the calculation involves multiplying the AMT base by 26%. If the AMT base exceeds $185,400 (or $92,700 for married taxpayers filing separately), any amount exceeding this threshold is multiplied by 28%. 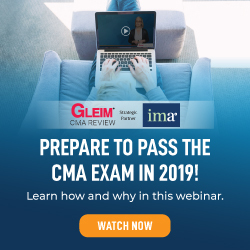 Taxpayers with business income frequently have AMT adjustments related to depreciation or depletion deductions, gains or losses on the sale of business assets, and installment gains. Table 1 illustrates the AMT calculation assuming a married couple filing jointly with regular taxable income of $240,000. Their regular income tax liability for 2015 will be $54,729. 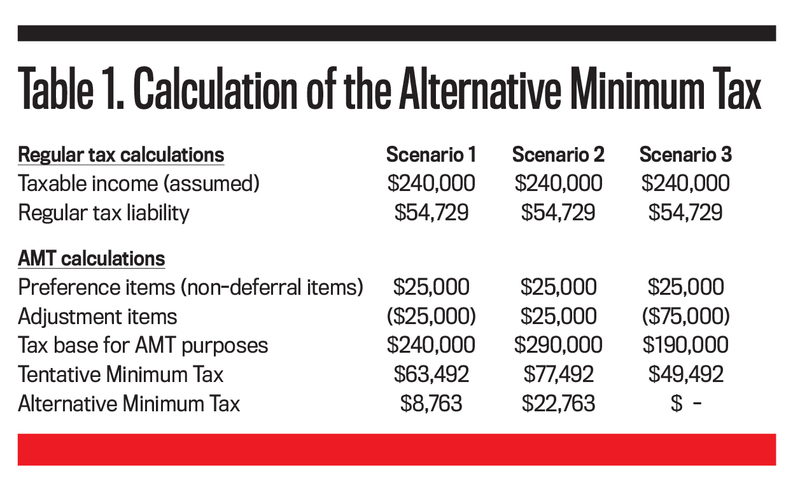 If they have adjustments and preference items that cancel each other out (Scenario 1), the tax base for AMT purposes is also $240,000 and their tentative minimum tax is $63,492 (28% ✕ ($240,000 – $185,400) + 26% ✕ $185,400). Since the TMT exceeds the regular tax liability, this couple will have to pay AMT in the amount of $8,763 (the difference between the TMT of $63,492 and the regular tax liability of $54,729). The AMT is added to the regular tax so that the couple will face a total tax bill of $63,429. Scenarios 2 and 3 involve situations where the couple’s adjustments and preference items don’t cancel out. 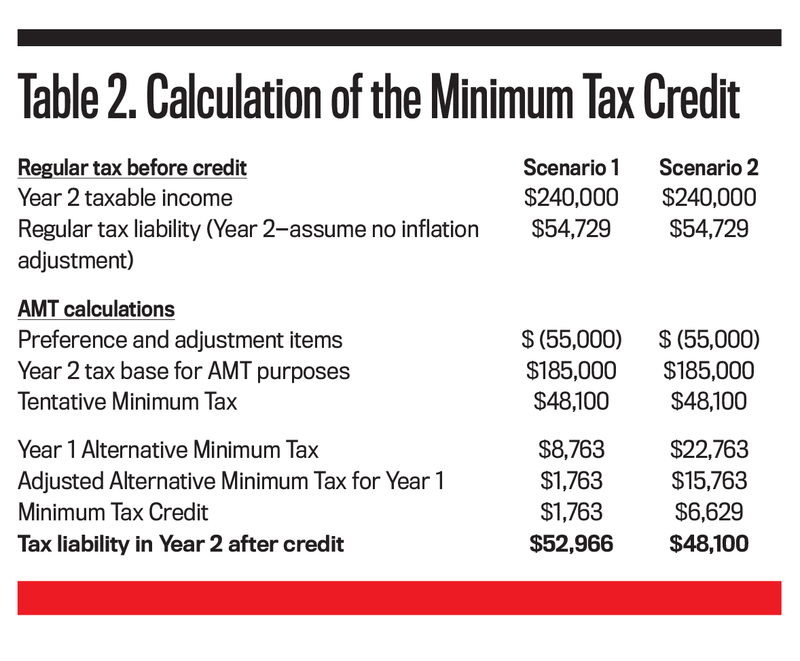 After adding all AMT preference items and subtracting or adding all adjustment items, their tax base for AMT purposes is $290,000 in Scenario 2 and $190,000 in Scenario 3. Thus, their TMT will be $77,492 or $49,492, respectively. They either don’t owe any AMT (in the case of a TMT below the regular tax liability) or owe AMT in the amount of $22,763 (the difference between $77,492 and $54,729). As outlined in Internal Revenue Code (IRC) §53, part of the minimum tax liability from a prior tax year can be carried forward and potentially used as credit in future tax years. 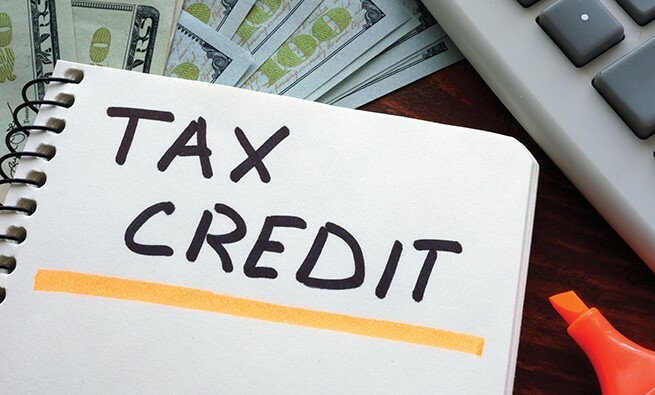 The amount of the credit, i.e., the minimum tax credit (MTC), is the sum of the adjusted AMT imposed for all prior tax years (since 1986) less the amount of MTC claimed in prior tax years (IRC §53(b)). Adjusted AMT is defined as AMT less the portion of the tax attributable to “non-deferral items,” such as miscellaneous itemized deductions, state and local taxes, percentage depletion in excess of basis, and interest income from private activity bonds (IRC §53(d)(1)(B)). The credit is limited to the difference between the taxpayer’s regular tax liability (reduced by the sum of all personal and business-related income tax credits except refundable credits) and the tentative minimum tax—with exceptions for certain tax years when part of the MTC was refundable to some taxpayers. 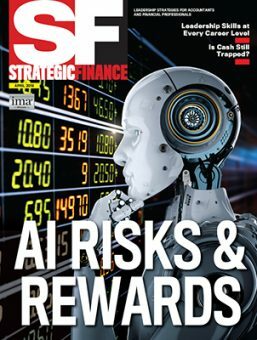 If, for instance, the couple from our example has the same taxable income of $240,000 in the next tax year but a tax base for AMT purposes of only $185,000, then their regular income tax (assuming, for simplicity, no change in tax bracket) is $54,729 and their TMT is $48,100. Thus, the couple doesn’t owe any AMT. The MTC is calculated by comparing adjusted AMT from the prior year with the difference between regular tax and TMT in the current year ($54,729 – $48,100). Adjusted AMT is the AMT in Year 1 using only deferral items and no preference items ($1,763 for Scenario 1 and $15,763 for Scenario 2). Table 2 summarizes these two situations. The MTC can be carried forward indefinitely, but it can’t be carried back. During the tax years 2007 through 2012, Congress expanded the minimum tax credit for individual taxpayers below a certain income threshold by making it (partially) refundable for taxpayers with “long-term unused MTC” (defined as MTC carryforward of more than three years). Furthermore, this extra MTC could be used to offset AMT as well as regular income tax. This provision was eliminated with the implementation of the Tax Increase Prevention Act of 2014 (P.L. 113-295) for tax years starting after January 1, 2013. Sonja Pippin, Ph.D., is an associate professor in accounting at the University of Nevada Reno. She can be reached at (775) 784-1337 or sonjap@unr.edu. Richard Mason, Ph.D., J.D., is an associate professor in accounting at the University of Nevada Reno. He can be reached at (775) 784-6886 or mason@unr.edu.